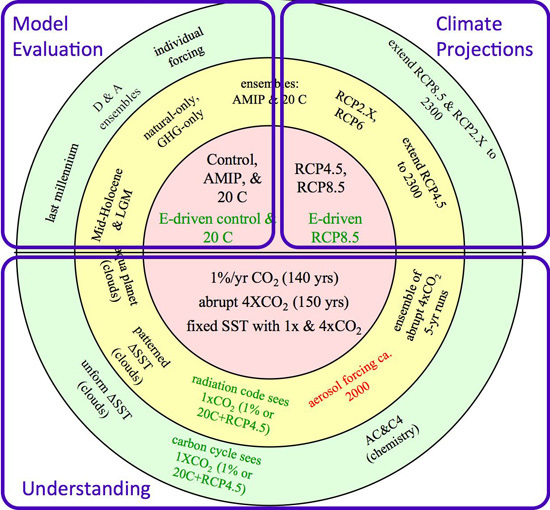 CMIP5 Climate Model Runs – A Scientifically Flawed Approach | Climate Science: Roger Pielke Sr.
My post today is to summarize the lack of scientific value in those model predictions with respect to “evaluate how realistic the models are in simulating the recent past” and, thus their use to project (predict) “future climate change on two time scales, near term (out to about 2035) and long term (out to 2100 and beyond.” My post brings together information from several recent posts. 6. Sun, Z., J. Liu, X. Zeng, and H. Liang (2012), Parameterization of instantaneous global horizontal irradiance at the surface. Part II: Cloudy-sky component, J. Geophys. Res., doi:10.1029/2012JD017557, in press. Vonder Haar, T. H., J. Bytheway, and J. M. Forsythe (2012), Weather and climate analyses using improved global water vapor observations, Geophys. Res. Lett.,doi:10.1029/2012GL052094, in press.